Fig. 6. 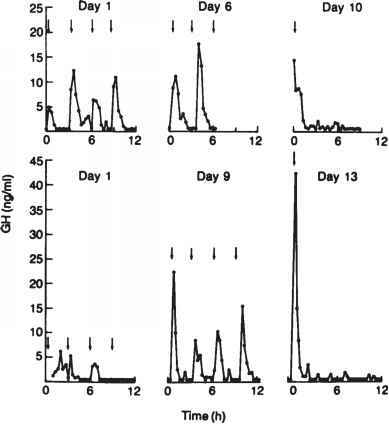 Growth hormone (GH) responses to the pulsatile administration of GHRH(1-44)NH2, 1 pg/Kg iv at 3-h intervals, to two children with idiopathic GH deficiency. The times of the injections are shown by the arrows. The magnitude of the GH responses to the injections varies over time, and in the subject shown in the lower panel the average response increases as treatment continues. GH levels return to low values immediately after the injections are discontinued. Modified from ref. 28.
it seemed reasonable to speculate that chronic co-treatment with an inhibitor of somatostatin secretion might induce a greater increase in growth velocity than treatment with GHRH alone. 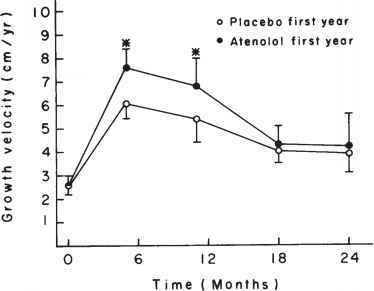 Confirming this speculation, we found that co-treatment with the P1-adrenergic antagonist atenolol increased the growth velocity response to GHRH during the first year of therapy, without side effects or a disproportionate increase in bone maturation (Fig. 8) (37). This approach could potentially also work using other inhibitors of somatostatin secretion, such as dopaminergic agonists, or using other agents which enhance the GH response to GHRH, notably the GHRPs. We showed that the acute synergistic effect of GHRH and GHRPs on GH seen in normal subjects is also observed in GH deficient children; the GH response to the two peptides given together is much greater than to either given alone (38). Fig. 7. Individual height velocities for 80 patients who completed 6 mo of treatment with GHRH, at baseline (A) and after 6 mo of treatment (O). 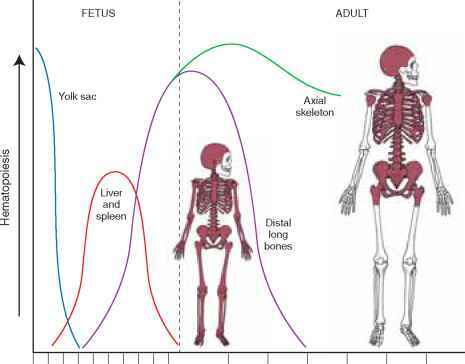 The subjects are shown in order of ascending baseline height velocities. From ref. 34. Fig. 8. Growth velocities in GH deficient children treated with once nightly injections of GHRH, 20 mg/Kg sc, plus either placebo or the p^adrenergic antagonist atenolol, 1 mg/kg orally once daily. 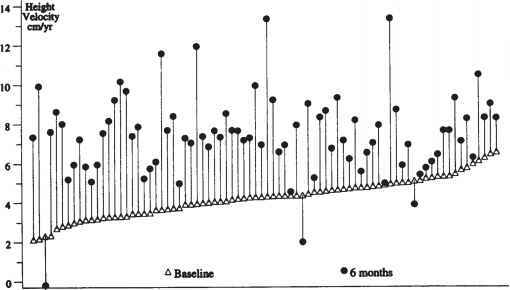 There is a significantly greater acceleration of growth during the first 12 mo of treatment in patients treated with GHRH plus atenolol than with GHRH plus placebo. *,p < 0.05 vs GHRH plus placebo. From ref. 37.
plete physiologic therapy. We have conducted a pilot study in which a GHRP, GHRP-2, was given daily to six children with GH deficiency, followed by the combination of GHRH plus GHRP for 2 mo (39). Growth accelerated into the normal range during both treatment programs, and GH responses to the two agents together continued to be greater than to GHRP alone. No longer-term studies comparing the growth velocity responses to single vs combined treatments have been reported. Because of rapid proteolysis, the duration of the effect of GHRH administered sc is relatively brief, and efforts are being directed at developing superagonist analogs (40) or long-acting formulations of this peptide. This strategy might help further simplify and enhance the efficacy of this form of therapy.